The Iowa Department of Transportation has rejected the appeals from four Iowa cities that all want to keep using speed cameras in their areas. Steve Gent, director of the Iowa DOT’s Office of Traffic and Safety, says the denials were issued to Cedar Rapids, Council Bluffs, Des Moines and Muscatine. The agency had previously ordered several cities to turn off some speed cameras on or adjacent to state highways saying they required more justification for their use. “Really what the DOT was looking for was new information, something new that would basically allow the DOT to say ‘yeah, that does make sense, keep the cameras,’ but we didn’t get that from the cities,” Gent says. The City of Council Bluffs has already turned off its speed camera. Davenport city leaders chose not to appeal the DOT’s order and shut down their camera earlier this year. The other cities can keep their cameras operating if they continue to appeal the DOT’s decision. “If the cities take this to district court, then of course it could go to the Supreme Court after that, throughout that entire process, the DOT will not take legal action to get the cameras turned off,” Gent says. In the letters issued to the cities, DOT Director Paul Trombino stated the cameras are not making interstate highways or nearby intersections safer. The City of Sioux City had previously filed a lawsuit against the Iowa DOT over the use of its speed cameras on Interstate 29. Gent says the DOT does not need to respond to the appeal from Sioux City as that case is being handled by the Iowa Attorney General’s office. 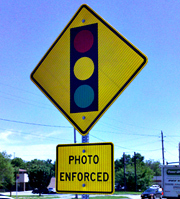 The citations issued to motorists from the speed cameras generate millions of dollars for the cities.